I’d like to see how you’re building web-interfaces with BASH sometime. I’d love it if you would send me a bundle o’ code to peruse. I have a script that uses curl to pull the JSON response into a single var, then extracts the vars I need by field position using cut. For changing values, I pass the vars via a GET to another script and use curl -d to post the JSON to the thermostat, and then poll the new vars live to build the page with the new vars when a change is made. It reads the new temp from the GET, and then calls the script to build the page afterwards. Nice, is that something you would share ? I would love to use this with my radiothermostat! I’d like to share it, and several people have asked for it, but it’s a mess at present intertwined with a bunch of other scripts I’ve written for monitoring for gathering data. I *do* plan on separating it out and posting something on here when I have the time. Hi, I’ve also been playing the 3m50 and also don’t like the idea of a remote site controlling my thermostat, gathering all the usage data etc. So I’ve been writing a program in C to control it. However one thing that is missing from the public API is any information about authentication. If I open a port on my router to control it from the outside of my LAN I’d want to use some kind of authentication.. Do you have any idea how to do that? For securing something like this, you generally want to expose your app, not the device. You would authenticate to your app, and your app would proxy commands to the thermostat. If your app runs on IIS, Apache or something similar you can use built in auth, otherwise build simple auth into the app itself. Good luck and happy coding! Is it possible to get a copy of the software you have built to log the information, and will it do two 3M50’s? I’ll add my request to see your scripts! Even if they’re ugly, I’d love to see the code you’ve used to build the interface. 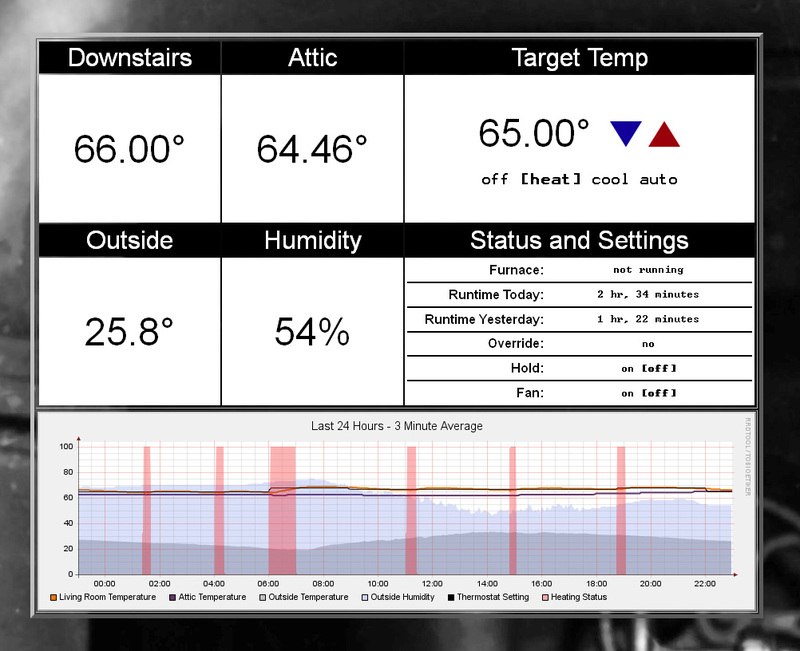 I’m comfortable interfacing with the thermostat, but would love to see some example code on building the display/graphs! I was looking for a simple web interface for my 3m50 and I always landed on your website, simply because your interface is for me the best one on the web. I would really like to encourage you to publish your code. 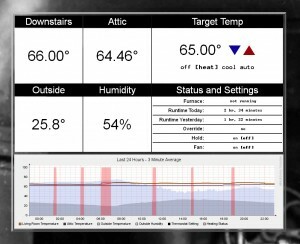 I believe there a loads of people out there who are looking for a simple, beautyful interface to manage their thermostats. It is “quick code” but it works. The Celsius part is perhaps something to integrate in your scripts? Is unavailable. How can I get the document? Necropost I know, but the API docs are posted by the manufacture now if anyone is looking for them. These thermostats are awesome, and the -80 version direct from Radio Thermostat has even more options.